The German made Kettler Favorit Rowing Machine has a circular rowing motion that is perfect for training at home or in the office. 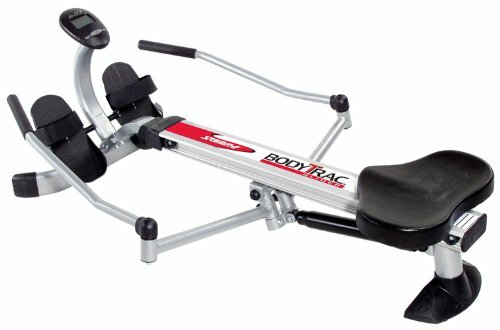 This rower features an adjustable tilt of up to a 45-degree angle, folding oar levers with a continuous force adjustment and extra thick hand grips, and two hydraulic cylinders to control resistance, of which there are 50 adjustable levels. These 50 adjustable levels are great for rowing novices and experts alike as it allows the user to completely personalize their workout, and once comfortable even mix up the resistances to fully maximize their experience. As mentioned earlier, the rear of the rower is raised a bit to provide a gravity-assisted return to the rowing machine’s starting position. This is a helpful feature for some, but it DOES slightly reduce the workout your legs receive when you are rowing on this particular rower. It also has smooth-operating ball-bearing seat rollers that are mounted on durable aluminum rails for a snag free workout. The pivoting foot plates feature straps for the safe positioning of your feet and ankles, while allowing your feet to move naturally as you row. The seat itself is wide, contoured, thickly padded, and heavy duty. This is a definite plus as it will be comfortable to spend an extended amount of time on, allowing you to workout as long as you wish. Another great asset is the battery powered training computer. This useful LCD computer measures time, your strokes, the speed of your strokes, the distance you have covered per session and in total, the precise measurement of the energy you have consumed, and your pulse rate. However, the measurements shown on the monitor are in the metric system, and the words below each measurement are in German. Your heart rate is measured with an earlobe clip that’s included, or you can choose the second option of a Polar T34 chest strap heart rate monitor. But, taller users may need to purchase an extension cord such as a stereo extension cable to allow them to fully pull back on the rower. The rower’s hydraulic cylinder resistance is controlled by a leverage style tension set of adjustments. Anti-slip floor protectors cover the bottom of the rower for safe use on multiple types of surfaces, ensuring that its durable high-carbon steel construction doesn’t damage your floors in any way. With a weight capacity of 285 pounds, this rower is accessible for almost anyone. The Kettler Favorit Rowing Machine’s assembled dimensions are 48 inches long by 31 inches wide by 10 inches high.